As I am originally from Afghanistan (though I grew up in Germany), Intercontinental was the first hotel chain I ever heard of. Intercontinental is, probably for most Afghans, the epitome of luxury and first class hotels. 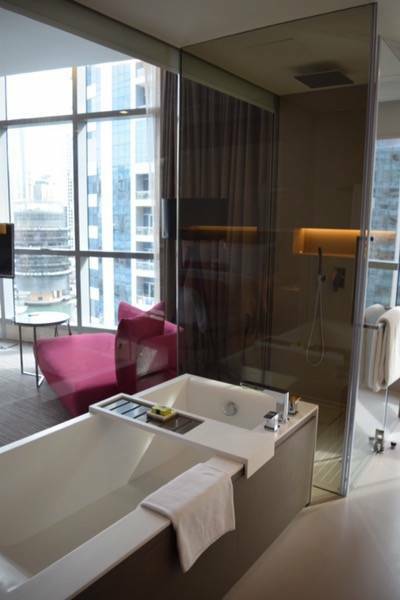 My expectations had been therefore very high before I checked in for two nights at Intercontinental Dubai Marina. To sum it up, I can say this hotel made me feel like home and I had an awesome time here. 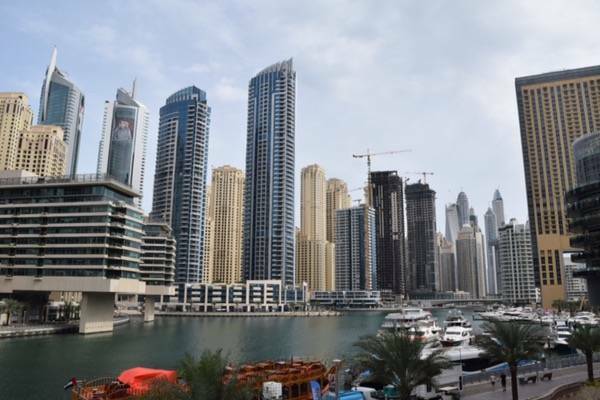 Intercontinental Dubai Marina is located in my most favorite part of Dubai: the Marina. The Marina was established in 2003 and is a beautiful area with many new restaurants and hotels. It also features a canal which is an inviting place for nice strolls. 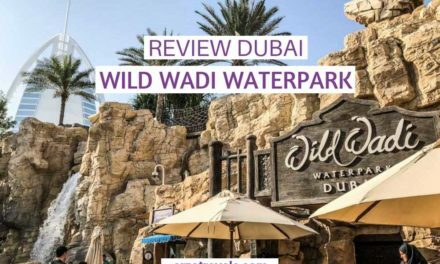 If you are curious why Marina is my favorite part and which other areas are great to visit click here.. 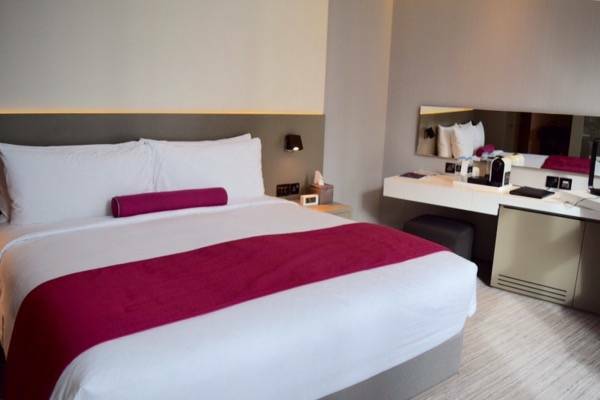 The hotel was built in 2014 and is very new and modern. The lobby presents itself as welcoming, spacious, and bright. I really liked the many different seating options which are spread throughout the ground floor and are an ideal place for working. The check-in was done quickly, by friendly staff, and I immediately felt welcomed. Though, I checked in early, I did not have to wait for long before my room became ready. The concierge also brought my luggage into my room while I enjoyed lunch and a spa treatment. After my check-in, the head concierge introduced himself and was very helpful in planning my time in Dubai. The guest relation´s officer, coincidentally a young German, also took very good care of me. The hotel´s 328 rooms and suites are (I assume) very modern with fair furniture and a lot of glass. 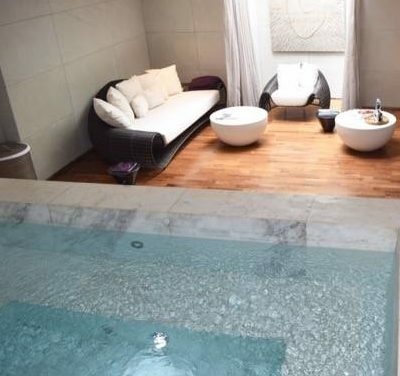 The bathroom was separated from the room by a glass wall. But no worries – for more privacy, you can always close the blinds. This allowed me to tick another thing off my bucket list: watching TV while taking a bath 🙂 The older I get, the more I appreciate nice views, and the view from my room was stunning. This view explains why I love Dubai Marina so much. 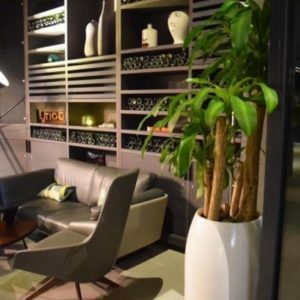 The hotel has several restaurants and offers casual dining options and well as fancy Michelin cuisine. I had the pleasure of enjoying several tasty dishes at Accents restaurant and YNOT, which more both nice but casual. Breakfast at Intercontinental Dubai Marina is served at Accents. There are several ways to make a person like me, who is not a morning person, look forward to waking up. A great breakfast is one thing:) Let me assure you; it is worth getting up earlier to enjoy a breakfast at Accents. Enjoy healthy food? You will be pleased to find a great variety of fresh and healthy options. Prefer something sweet in the morning? You will not get disappointed with the sweet treats available. Also, apart from hot and cold drinks, several kinds of fresh juices were served. There are also all kinds of bread, warm and cold dishes, cereals, different kinds of milk (including soy milk) fresh fruits and vegetables, desserts and much more. YNOT was quite a surprise. 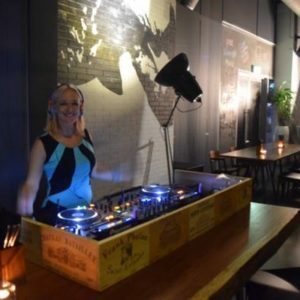 I did not expect such a cool restaurant at Intercontinental Dubai Marina – a DJ spins the discs (YNOT opens for dinner only) though it is not a club. 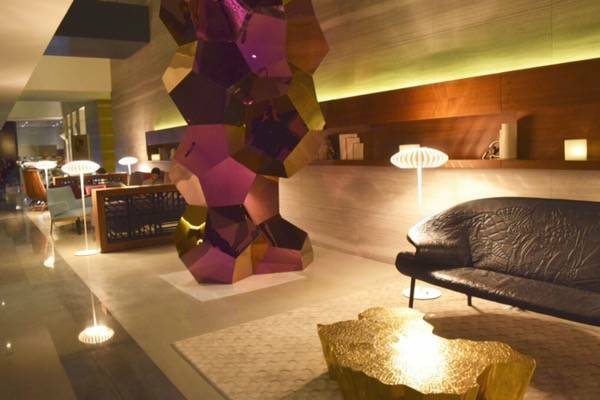 No wonder the guests are younger, and it is probably the hippest place in the hotel. The food was great and I had awesome vegetarian side dishes which were all tasty. I even topped it off with a delicious dessert. I think there is no need to talk about great staff in both restaurants and I enjoyed every minute. If you like fancy dining, you can check out Marina Social, which is led by a Michelin star chef. Or if you just want to grab a quick bite, you’ll most likely appreciate Accents deli, which is located on the ground floor. 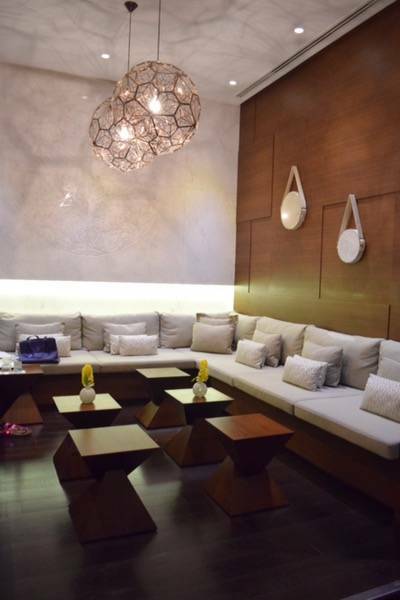 Let´s talk about one of my most favorite places ever: The Spa at Intercontinental Dubai Marina. I hit the spa three or four times in 48 hours and not only enjoyed a perfect spa in a perfect atmosphere, but also jumped into the Jacuzzi often. There is a spa section for men and women, and everything is spotlessly clean and quiet. Right now, I cannot think of many places where you can relax as well as you can here. After a short preliminary consultation with the masseur, I enjoyed a great massage, and the only thing I regretted was that it stopped after one hour. There are showers, bathrobes, and all other important amenities. Though the very nice receptionist (I love it when people share my kind of humor) tried to motivate me to go to the gym, I politely ignored it (shame on me). I preferred spending time in the Jacuzzi, which I had to myself most of the time, or checking out the pool. I am not a good swimmer, but for some reason, I am totally into pools and water. The pool at Intercontinental Dubai Marina is not the biggest, but big enough to take a swim or, like I normally do, just splash like a child. I was lucky with the weather (not too hot) and could lay down next to the pool for a while. If it gets too hot, I recommend relaxing in one of the “pavilions“ that offers some respite from the heat. As I said earlier, I had high expectations of the hotel and I am happy I did not get disappointed. 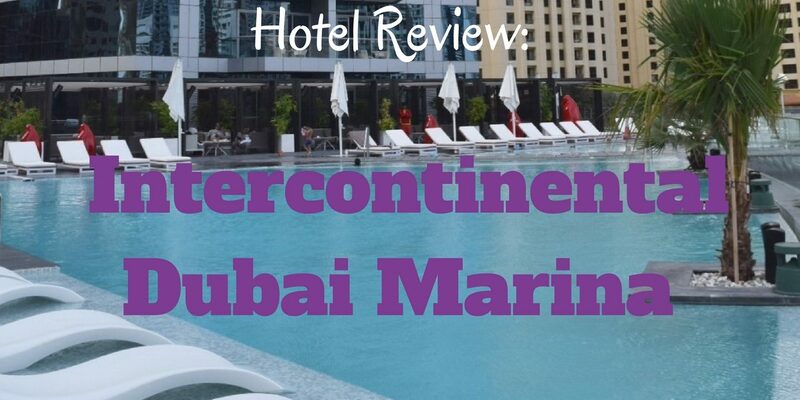 In Dubai, where everything is about luxury, Intercontinental Dubai Marina might not be the most luxurious hotel but it is awesome in any way. It is a top-notch hotel while they also have friendly and helpful staff and a great location. 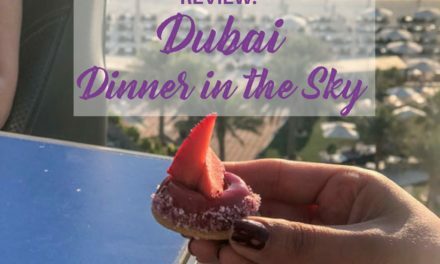 There is something to suit everyone’s taste when it comes to dining, and the Spa has become one of my most favorite places in Dubai. 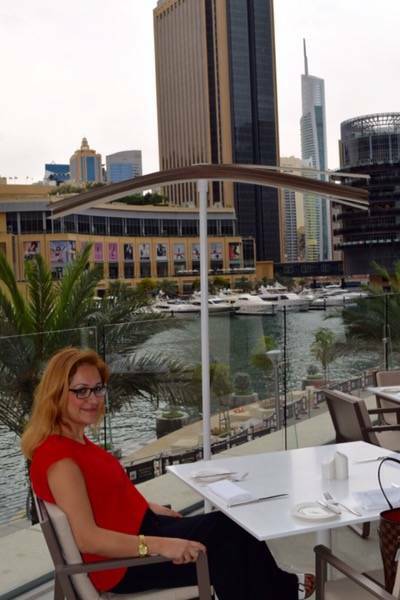 I told my mom about all the places and plans for my Dubai trip, but most of all, she got so excited about my stay at Intercontinental Dubai Marina. If I had the chance to take her to any hotel, I would choose this hotel. I am sure she would love it the way I did, and she would be as overwhelmed as I was. 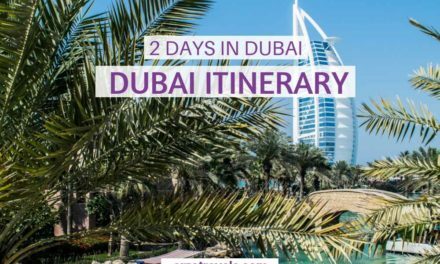 If you want to find out about great hotels in Dubai for all budgets click here. 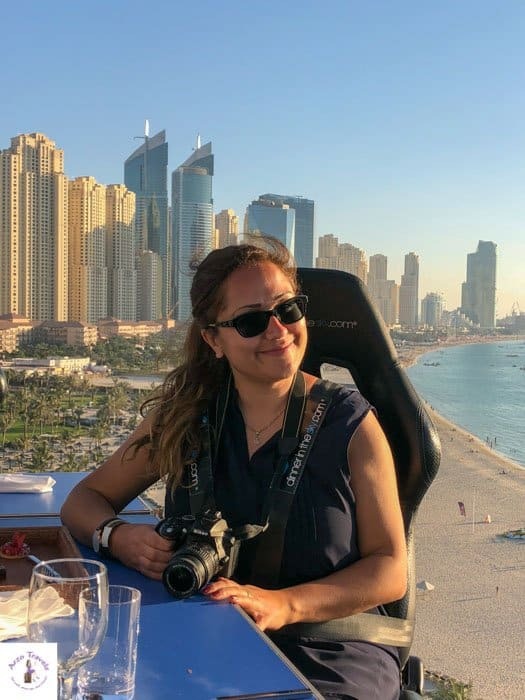 Disclaimer: I was a guest at Intercontinental Dubai Marina, but as always, these are all my pictures and my own opinion. Actually, I asked to extend my stay for one night (at my own cost), because I liked it so much, but the hotel was fully booked. A helicopter flight in Dubai is as great as it sound. Click here to find out more.